An important Trustees meeting on Tuesday evening when we discussed a long term strategic issue and made I think the right decision- an opportunity, not a threat. Trustees also discussed the business plan for the year. The principal concern was about the amount of work we have to do in the office, and for our health, which was very kind and supportive of Trustees . We have already moved on recruiting a new member of staff to help us, as we have been commissioned by Surrey CC to administer their small grants scheme. We are also delighted to be welcoming two new trustees soon- at the next meeting – from Surrey Minority Ethnic Forum and a student representative from Guildford FE College. The Local Prevention Framework (£2.5 mill grants from Surrey CC) has generated a lot of work all round the place for bidders, and us in advising them – I had a call from Manchester yesterday about it! Now is not the time to do the “post-match analysis”, but I do have strong views about it, which could be summarised in this quote from an experienced manager (NOT in the Consortium): “It is a shame that the SCC approach forces us into a competitive position and doesn’t anticipate that “open” agreements between providers could secure a better delivery approach and outcome”. Closing date for bids is next Friday at 3.00pm – good luck! Met with the manager of Metro Bank in Guildford yesterday, being the new, and very trendy but “old – fashioned” bank that is starting up in London and the SE only, and trying to break the Big 4 monopoly. I was talking to him about what we do and the possibilities for sponsorship/collaboration. They do have a great feature that my 4 year old grandson would love….a video screen money box into which you drop your piggy bank coins, and the machine counts them up and you get a ticket and interest back. How good is that! If you talk to Metro nicely they’ll let you use it to count coins automatically from collecting tins. The high point of the week was going to the House of Commons to attend the awards given by various MP and Peer Patrons of the Youth Engagement Service (YES) who do fantastic work in transforming the lives of the most challenging young people. YES does so using ex- prisoners who have seen it all /done it all, and transformed themselves, and so are an inspiration to young people who have gone off the rails. My big conclusion was that it doesn’t take much to keep young people on track – it’s called parental/family love, but if it’s absent there are massive pressures propelling young people the wrong way. So well done to YES! Preaching on Sunday…about Learning….Education….E Duco…Ex Duco …Latin “…to lead out of..to question” as in Socrates encouraging students to ask questions………. The week didn’t start well as we made an error in our admin which was understandable when we are so stretched, but we started the week with a bit of a down - I am a perfectionist, and don’t like criticism - who does? But then we built up in the week to a really positive enterprising week. We had a great strategic discussion with our inner group of Trustees on Tuesday about possible developments for SYF in the future – this built on our “Big Assist” discussions last Friday – more to follow. These are cutting edge discussions and very creative/exciting. Part of the good news this week is that we have been asked to administer Surrey CC’s Small Grants Programme (£220,000 or so ) this year for which we are receiving a fee. This is exciting for us, as it enables us to get closer to local youth groups. We are already building our database of youth organisations, by borough, and have 300 entries thus far. The income for managing this grants scheme is also valuable, and we have also bid to a GMT for funding to set up a Funding Support Service – we know that securing funding and volunteers are the key member needs. I am a director of the social enterprise we have been working on for some years, and we had a great meeting on Thursday with someone who will be brilliant as the first staff member doing the start–up, which I am mostly doing now, so I feel really positive about this. The bank account is set up, and start up funding going in. We will then be recruiting disadvantaged young people and training them up through Guildford FE College. So…….. enterprising! And finally our Members Satisfaction questionnaire results are in – we do this survey monkey test every 2 years, so as not to trouble members too often. The results are very good from a high response rate : 34.1% are very satisfied, and 61% satisfied = 95.1%, with only 4.9% partly satisfied and no one dissatisfied. I need to check these figures against the previous ones, but seems pretty good to me!! And good to report to Trustees meeting next week. So we end on a high! I was 30 when Mrs Thatcher came to power, and so I closely observed all her years in Government. She was clearly a great political leader and Prime Minister, and a politician of both principles (free market, individual responsibility, opposition to Communism, the unions, the IRA, Euroskepticism, defence of the realm - Falklands etc) and of conviction – the forceful speech and manner. However she was also someone who divided opinion dramatically , even now after her death, as many recall the continuing consequences of the downside of many of her economic, financial and industrial policies. But history is always written by the winners, and she definitely won. It’s been a busy week with the Local Prevention Framework grant process to the fore – there’s only until 3 May to get your bid in. We have been retained by SCC to promote the scheme and have sent out two briefing notes so far to 300 organisations to promote it, and had meetings about it. I’ve also discussed Safeguarding with a SCC colleague brought in to address wider issues. I do have some concerns about policy and practice as so much has changed of late. We had to postpone this week’s workshop on self-employment/social enterprise because of lack of take-up, but I met with a Director at Epsom BC who wants us to run a course for him in September, and it may well be that the best way forward is to link to Colleges, and other local authorities. We interviewed to recruit a young apprentice to support us in the office but have been unable to appoint and so are re- advertising. It is a great opportunity to learn on the job, gain skills and get a Level3 (A –level) award. We have good news about COMMUNILAB and hope to have a significant national as main corporate sponsor – more later. 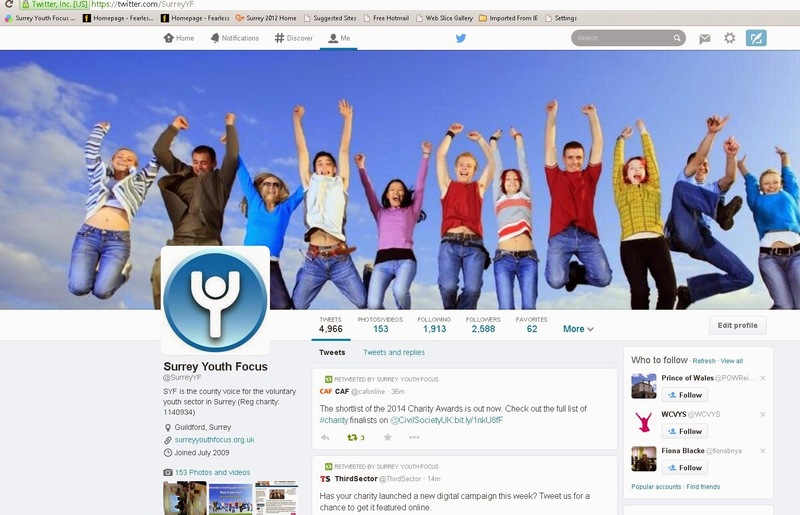 The latest edition of Surrey Youth News is out with our new brand , which has been well received thus far. Had a great telephone conversation with someone who might be brilliant as the key person organising the start-up of the social enterprise – at the moment it feels like my third job (after SYF, and development adviser to the Consortium- for whom I have been working on a mental health bid this week. SO..busy! Have fun – I always do! It seems that most sensible people have been on leave this last week, and in this relatively quite period we are launching our re-branding. We wanted to give Surrey Youth Focus a more contemporary and purposeful look and I think we have achieved that - there is a great "ripped cover" edition of Surrey Youth News to look out for that introduces the new brand. Of course, we have started a new financial year and whilst at present we have set a deficit budget I am hopeful that a couple of irons in the fire will come off sufficient for us to have a balanced budget at the year end (ie March 2014), so I am cautiously optimistic. We are in the process of recruiting a Business Admin Apprentice to help raise our capacity (remembering that we are only 2.5 FTE) and now working well with Guildford College in this - there are 4 candidates. Blog readers may find the cost of an Apprentice to employers interesting, and I'll set these out next week. I have had several excellent meetings this week about young people and mental health to assist me in writing a bid for the Consortium about developing a specific programme and training for voluntary sector youth workers about mental health and well being issues. Of course this has been the week when the Clinical Commissioning Groups have commenced (just 6 in Surrey). I predict now that within two years there will be a national press scandal about CCGs sending patients to companies in which the same doctors have a financial interest, and compromising their position as objective commissioners. It won't work..bring back PCTs! The serious strategic point that one sees in many sectors is the clash between giving localism and choice (academy schools, health, local government,) and Government's wanting to retain centralised control, and finding that localism generates too much disparity and cost, and so we see clusters form - of groups of academies and so on. Busy week next week. I am on leave today..just one local meeting with Working Links...Mrs Abbott a bit irritated about work/home life balance..better go...have fun ...I am in the doghouse!